Consists of a steel strip, 4 in, long, with ends slightly bent in opposite directions, 1/8" slots are cut across the width near the ends. Used for adjusting the armature extension arms of AT. & E. Co., ST. & C. and Ericssons’ horizontal-type relays, and AT. & E. Co. polarized relays. Consists of a steel plate on which are mounted two adjustable clamps and two lever-type handles; one fixed and the other movable in a restricted rotary direction, The front Clamp is used for adjusting the armatures of P.O. 3000-type relays, G.E.C. and Siemens’ pendant armature relays. The rear clamp is used for the armatures of 600-type and 500-type relays. Consists of a 4.5" long, round-section, steel bar, bent at one end and having an enlarged circular head with a slot 3/8" deep. Used for adjusting the armatures of Siemens’ No. 50 uniselectors. 3.6" Long. Consists of a square section steel bar, with a 5/16" slot at one end and a fixed tommy bar at the other. Used for adjusting the armature stops of Siemens’ No. 5 and 16 uniselectors, also the release armature extensions of Siemens’ No. 50 2-motion selectors and G.E.C., AT. & E. Co. arid ST. & C. minor switches. Consists of square-section steel, 3.75" long, with slots cut across the width at the ends. For adjustments to the armatures of Siemens’ No. 5 and 16 uniselectors. 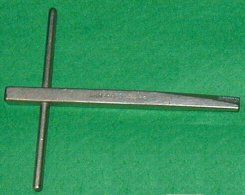 5.25" long, made of 5/8" x 1/4" steel. At one end a 5/16"	slot is cut along the length, and a 5/16" slot is out across the thickness near the other end. A hole, which is drilled through the thickness near one end of the tool, is provided for a tommy bar and assists in effecting adjustments in a rotary direction. Used for adjusting vertical and rotary armatures of 2000-type selectors. Consists of a screw. 1.5" long, with a knurled head. Used for effecting stroke adjustments on the rotary armatures of 2000-type selectors. 6 in. long. Consists of a steel blade with two projections - at one end to form a slot. 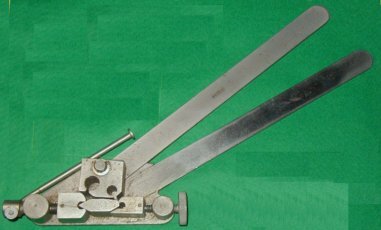 Two strips of wood, 4" long, are riveted to the steel blade at the other end of the tool to provide a handle, Used for adjusting the armatures of uniselectors and sequence switches fitted in Units, Auto. No. 4.